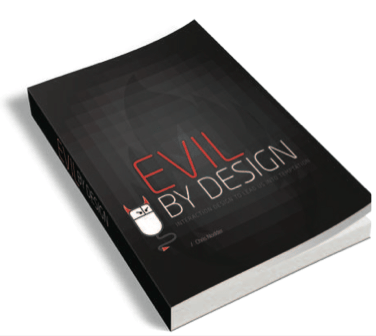 Evil design implementations grouped under the seven deadly sins, with tips on how to use each pattern, and examples from real life and the Web. Examples of evil designs from around the Web. Explanation of how each one works and why we fall for it. Introduction to the psychology of persuasion explains how our brains are wired to respond to certain sales techniques. How-to steps to replicate these patterns on your own site. Learn how to use the same principles either for good or evil. Read a sample chapter FREE (2.5Mb PDF) – all I ask in return is that you tweet about it. Then go buy the book from Amazon or from Amazon UK! Pride. Use social proof to position your product in line with your visitors’ values. Sloth. Build a path of least resistance that leads users where you want them to go. Gluttony. Escalate customers’ commitment and use loss aversion to keep them there. Anger. Understand the power of metaphysical arguments and anonymity. Envy. Create a culture of status around your product and feed aspirational desires. Lust. Turn desire into commitment by using emotion to defeat rational behavior. Greed. Keep customers engaged by reinforcing the behaviors you desire. Now you too can leverage human fallibility to create powerful persuasive interfaces that people will love to use – but will you use your new knowledge for good or evil?